We love our goats, but building a goat yard can add up in costs! Which is why using free recycled wooden pallets is such a great way to go! Below are 6 super easy pallet projects for your goat yard to help you DIY and cut costs while building your homestead! Most, or all, of these projects use full pallets, so you don’t have to struggle to disassemble them- just grab your screws and drill and you are ready to go! 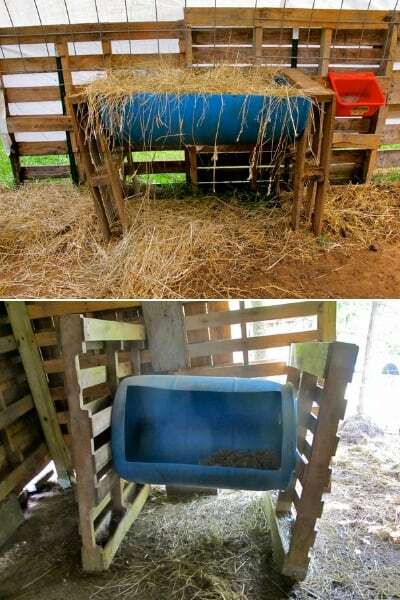 Are you ready for some super easy pallet projects for your goat yard?? Let’s take a look at 6 of the easiest ways to create your goat yard must-haves like fencing, hay feeders, barns and more! Hay feeders are expensive! More expensive than I think that they ought to be! And you know, they often don’t work as well as they should or fit as much as I think they should. Luckily, pallets are just perfect for building hay feeders! Above you can see 2 that I made using pallets as the legs and recycled plastic barrels to hold the hay. They aren’t much to look at, but the only cost involved was the screws! And they hold a lot more hay than our store-bought one! If you are more handy than I am, take a look at the pallet hay feeder that Delci at A Life of Heritage made for her goats! Barns are one of my favorite pallet projects for my goat yard! When we first moved to our current homestead we didn’t have any shelters and we had to make them- quick! Pallets make great walls for goat barns! 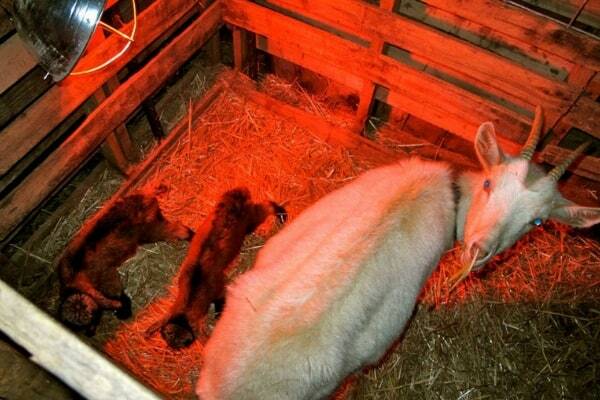 We have 2 types of shelters made from pallets in our goat yards. A permanent full 10x10 barn that is 2 pallets-high and has siding and a roof. This is our main barn, especially for the winter. You can see how we made that barn here: How to Make a Pallet Barn. We a couple really quick and inexpensive shelters made from pallets, cattle panels and a tarp. You can see the full details on how we made them here: How to Make a Quick Pallet Shelter. 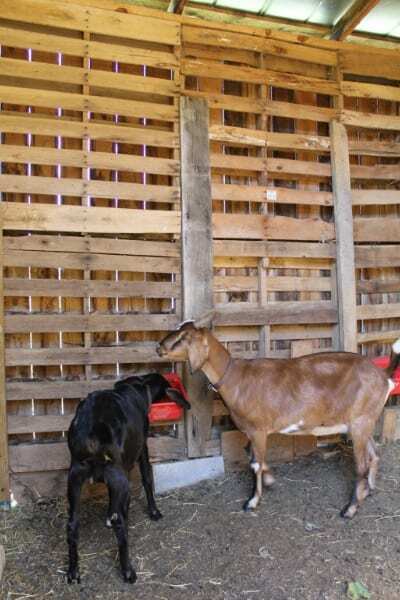 If you plan on raising goats for milk you will definitely need either a lot of barns or you will need to divide your barns into a few stalls for kidding. Stall are also great for separating hurt, sick, or new goats. Pallets are a great way to make stalls in your goat barn! For kidding we make small stalls- about 1 standard pallet wide and 2 pallets long. This is a nice small, safe space for your new moms and their babies to stay close and warm together. Pallets are also easy to extend, move, and take down, so you can move things however you need to in your barn. 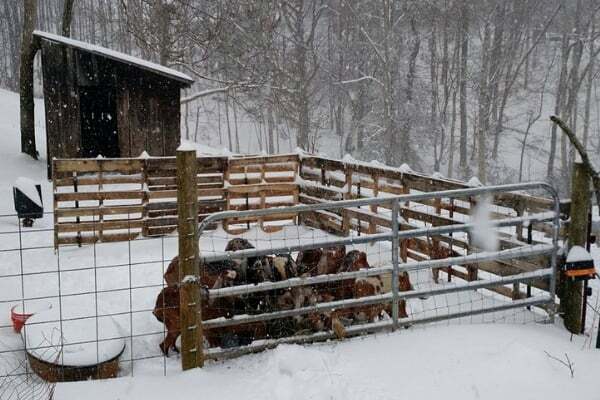 Corrals aren’t always a necessary addition to your goat yard, but they can be helpful. We used ours more when we had alpacas, who didn’t willingly come to meet us when we needed to work on them. Our pallet corral is mostly used for feeding time with our goats. We can easily hook their feeder buckets on the slats and attach their leashes as well. 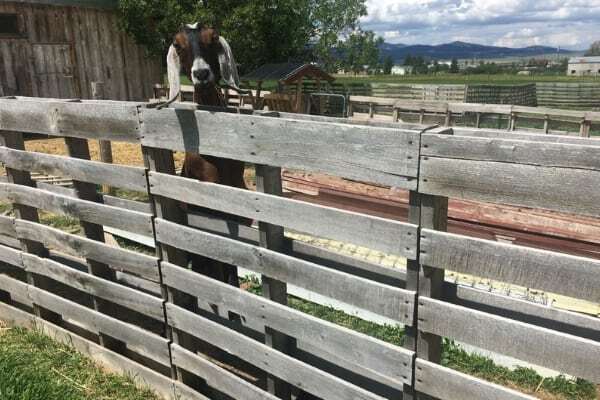 To make a corral all you need is pallets, screws, and a few t-posts. Super easy and quick pallet project to put together! Just like with with the corral, you can create an entire goat fence using pallets! They actually make a really nice looking, sturdy fence for your goats. And using t-posts and screws it’s not too hard to dismantle if you need to. Pallets screw together quite easily, so you can extend whenever you need to. The fence above was build by Delci from A Life of Heritage. You can get all the details for how she made it on her post How to Make a Pallet Fence. 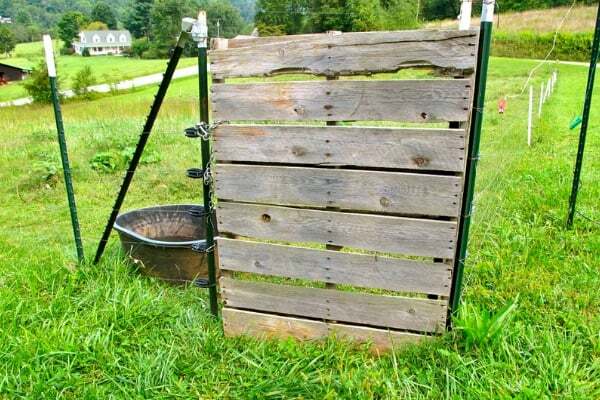 And finally, you can even use pallets to build a gate in your goat yard! Yes, you can build a prettier gate with bought or recycled wood, but this is just so, so simple to make. Make probably isn’t the right word. Assemble. might be better. This gate is simply a pallet, placed over a t-post, which is then wired to a t-post just outside the pallet to create a “hinge”. That’s it. 2 t-posts and a pallet. We’ve used these gates for goats, alpacas, and pigs. And they’ve never failed us yet! Congregation madam Sarah for your assistant to many farmer’s. Am a young farm from kenya. Your have educated me and to put me in a high hope that after 10year to come l will be learning my Runch and l will invite you to visit my home kenya. Thankyou..